As the 40th anniversary of reform and opening approaches in China, we have seen the emergence online in September of quite a number of posts or speeches from various quarters expressing some level of opposition to reform and opening. 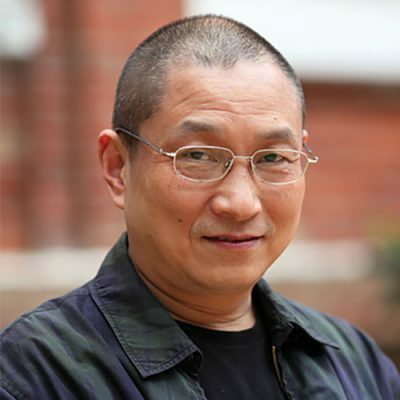 On September 11, a post by Wu Xiaoping (吴小平), a finance expert and web entrepreneur, suggested that “China’s private sector has already done its job in aiding the development of the state economy, and it should now leave the stage” (中国私营经济已完成协助公有经济发展的任务, 应逐渐离场). Wu’s suggestion that China’s private sector should yield to the state so that China could consolidate its strengths and prepare in a unified and concerted way for an economic showdown with the United States and other major competitors generated a great deal of debate last month. The very same day as Wu Xiaoping’s provocative post, Qiu Xiaoping (邱小平), deputy director of the Ministry of Human Resources and Social Security, delivered a speech at a meeting in which he suggested employees of private companies should “participate in the management of enterprises, and share in the fruits of enterprise development” (参与企业管理、共享企业发展成果). 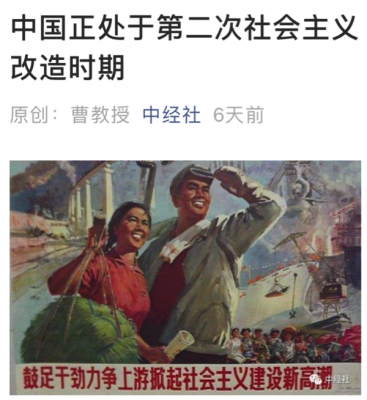 Just five days later, on September 16, a professor from the local Party school in Changsha published an even more eye-catching article under the headline: “China Is in its Second Wave of Socialist Transformation” (中国正处于第二次社会主义改造). This series of anti-reform remarks caused quite a stir on the internet in China. How was it that “socialist transformation,” or shehui zhuyi gaizao (社会主义改造), this phrase already seen very rarely in the media, had again become a focus of discussion? With the establishment of the People’s Republic of China in 1949, a system of new democracy (新民主主义制度) was put into place. From 1952 to 1956, a process of so-called “socialist transformation” was carried out across sectors, from agriculture and handicrafts to the capitalist commercial sector. It was from this process of “transformation” that the basic system of socialism in China was established. Mao Zedong carried out a wide-scale program of elimination of the private sector, and he sought to rapidly and completely realize what he called “large in size and collective in nature,” or yida ergong (一大二公). This phrase, first appearing in a commentary in the People’s Daily on September 3, 1958, referred to the establishment of people’s communes – which opened the curtain for China to a series of social and political calamities. 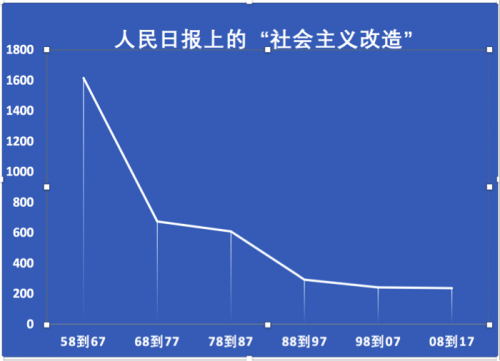 The following graph shows the occurrence of the phrase “socialist transformation” in the People’s Daily from 1957 to 2017 in ten-year increments, based on the total number of articles in the People’s Daily database including the phrase. Consider the the dramatic decline in use of the term happens also as the People’s Daily itself expands in size through to the present day. After the start of economic reforms in the late 1970s, the phrase “socialist transformation” grew cold in the People’s Daily. The same trend could be observed at Party Congresses. From the 8th National Congress of the Chinese Communist Party, held in 1956, to the 11th congress, held in 1977, on the cusp of reforms, the phrase was always treated positively in the political report—with the exception of its absence from Zhou Enlai’s political report to the 10th congress, composed while Zhou was ill. The reports to the 9th and 10th congresses both emphasized that once the socialist transformation had been completed, the “class struggle,” or jieji douzheng (阶级斗争) would still exist, and that the “dictatorship of the proletariat” (无产阶级专政) would still need require strengthening. ……Beginning from the latter part of the 1950s, owing to the influence of the “left,” we were impatient for success and blind to quality, mistakenly believing that with only our subjective desires and by relying on mass mobilization, we could drive dramatic increases in productivity; mistakenly believing that the bigger and more communal the system of socialist ownership the better. We even for a time placed the development of productivity in a secondary position, keeping “class struggle as the central task” even after socialist transformation. …… Our country, from completion of the socialist transformation of the privatized means of production in the 1950s, to the basic realization of socialist modernization, requires at least more than a century, and we are in the primary stage of socialism. …… Our nation’s current political system was born from the war of revolution and firmed up in the process of socialist transformation, and it developed [further] through a process of large-scale mass movements and constant strengthening of command programs. It is unsuited to the carrying out of economic, political, cultural and other modernizations under conditions of peace, and unsuited to the development of a socialist commodity economy. Looking at these three contexts, we see that the 13th congress did not offer a positive affirmation of the notion of “socialist transformation.” Zhao Ziyang’s purpose in raising the term was to delineate and emphasize reform. From the 14th congress to the 17th congress, the phrase “socialist transformation” disappeared altogether from the political reports that came every five years. In fact, the economic system instituted after the onset of reform and opening was essentially a denial of socialist transformation. China not only pushed back to the era of new democracy, but drew even closer to capitalism. …… The first generation of the collective leadership of the Central Committee, with Comrade Mao Zedong as the core, led the entire Party and the people of the entire nation in completing the new democratic revolution, carried out a process of socialist transformation, firmed up the foundational system of socialism, and successfully realized the greatest social transformation in the history of China, laying the basic political conditions and system foundations for all development and progress in modern China. But in the most recent political report for the 19th congress last year, we again see the term “socialist transformation” disappearing. This absence in the 19th congress report is something to consider. On September 27, Hu Deping (胡德平), the son of Hu Yaobang (胡耀邦) and former deputy head of the United Front Work Department, delivered a speech called “Remaining Alert to New Joint State-Private Ownership Under the Banner of Sharing” (警惕打着共享的旗号搞新的公私合营). The term gonghe siying (公私合营) in this headline, which roughly translates “joint state-private ownership,” is closely association with the socialist transformation process of the 1950s. That process began in June 1953 after an investigation conducted by the United Front Work Department that resulted in the drafting of “Opinion on the Use, Limitation and Transformation of Capitalist Commercial Businesses” (关于利用、限制、改造资本主义工商业的意见). Cao Xihua (曹习华), the author of the article that began this discussion, “China Is in its Second Wave of Socialist Transformation,” is an assistant professor at the Changsha Municipal Party School. Materials online show that he has lectured on “the spirit of the 19th congress” at many departments and companies. Professor Cao may not actually realize that the most recent political report to the 19th congress already took the step of toning down affirmation of the 1950s socialist transformation. But he is surely sensitive to the larger atmosphere in recent years of “the state advancing while the private sector retreats,” or guojin mintui (国进民退), and perhaps he felt that talk of a “second wave of socialist transformation” had a certain ring to it.